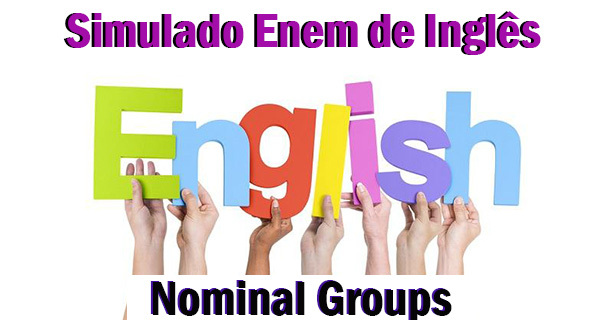 Teste seus conhecimentos sobre os Nominal Groups para mandar muito bem na hora da prova! São apenas 10 questões do Simulado Enem de Inglês. Caso erre, tem dicas para estudar! Veja. habilidade das pessoas em operar robôs sofisticados é surpreendente. A couple of weeks ago I was asked what I thought the future of technology in education was. It is a really interesting question and one that I am required to think about all the time. By its very nature, technology changes at a fast pace and making it accessible to pupils, teachers and other stakeholders is an ongoing challenge. So what is the future? Is it the iPad? No, I don’t think it is. For me, the future is not about one specific device. Don’t get me wrong, I love the iPad. In fact, I have just finished a trial to see if using them really does support teaching and learning – and they have proved effective. I’ve written about the trial in more detail on my blog. iPads and other mobile technology are the ‘now’. Although, they will play a part in the future, four years ago the iPad didn’t even exist. We don’t know what will be the current technology in another four. Perhaps it will be wearable devices such as Google Glass, although I suspect that tablets will still be used in education. The future is about access, anywhere learning and collaboration, both locally and globally. Teaching and learning is going to be social. Schools of the future could have a traditional cohort of students, as well as online only students who live across the country or even the world. Things are already starting to move this way with the emergence of massive open online courses (MOOCs). For me the future of technology in education is the cloud. Technology can often be a barrier to teaching and learning. I think the cloud will go a long way to removing this barrier. Why? By removing the number of things that can go wrong. Schools will only need one major thing to be prepared for the future. They will not need software installed, servers or local file storage. Schools will need a fast robust internet connection. Infrastructure is paramount to the future of technology in education. We don’t know what the new ‘in’ device will be in the future. What we do know is that it will need the cloud. Schools and other educational institutions will need to futureproof their infrastructure the best they can. What are the correct translations for the nominal groups in the text? Germany could face widespread winter blackouts following Angela Merkel’s “knee-jerk” decision to decommission the country’s nuclear power stations, according to German power grid operators. The warning from four energy providers _________¹ the German chancellor suggested she agreed with a proposal to _________² all of Germany’s 17 nuclear power plants by 2022. Seven nuclear power stations have been off-grid ever since Merkel announced in the immediate aftermath of the Fukushima disaster a “threemonth moratorium” on her controversial decision last year to extend the lives of the plants. Merkel ordered safety checks on all reactors and _________³ two commissions – one on safety and another on ethics – to look at whether Germany had a nuclear future. The resultant safety report will be evaluated by the German government, along with a separate report by an ethics commission due on May 28, before it makes a final decision on nuclear power. But over the weekend, Merkel said the year 2022 was “the right space of time” to set as a goal for Germany’s total withdrawal from nuclear power. She was speaking after the CSU – the Bavarian sister party of her Christian Democratic CDU – voted for all German nuclear power plants to come off-grid by 2022. Merkel did not herself commit to a firm date for nuclear decommissioning. The timetable is too slow for many of Merkel’s opponents. Claudia Roth, co-head of the national Green party, which beat the chancellor’s CDU in elections in Bremen on Sunday, insists it would be feasible to close down all plants by 2017. According to a report in Monday’s Süddeutsche Zeitung, four firms which operate Germany’s network of high-voltage power cables and pylons – 50Hertz, Tennet, EnBW Transportnetze and Amprion – believe Germany cannot currently _________ (4) nuclear power. The companies say that the grid is already “largely exhausted” during winter months when solar power is at a minimum and when wind cannot be ________(5) to keep turbines in motion. The firms warned in a statement that calm winter days with no wind could result in “large-scale supply disruptions”, particularly in Germany’s affluent and industry-heavy south, which guzzles much of the country’s electricity. “A safe supply to customers in these cases could be severely compromised,” they said. There are no current problems because good weather in Germany has meant that solar panels have been able to compensate for the shortfall left by the decommissioned nuclear plants. The industry group German Atomic Forum cautioned against abandoning nuclear power without careful consideration. “A quick and rash exit from German nuclear power would raise costs for the whole economy, make us miss climate goals, raise our reliance on fossil fuels and make our power supply less secure, meaning more power imports and problems with network stability,” said president Ralf Gueldner. “It would also spark intense debate in the European Union,” he added. Nuclear power has long been unpopular in Germany and Merkel’s decision last year to extend the life of nuclear plants was a major factor in her party’s loss of power after 60 years in Baden-Württemberg – a prosperous conservative state – in March. Her about-turn on nuclear policy was derided as “knee-jerk” by many of her critics. Currently, nuclear energy supplies 22.3% of Germany’s electricity while coal provides 42%, natural gas 13.6% and renewable energies 16.5%, according to the environment ministry. ( ) The period of time in which the consequences of an accident are dealt. ( ) Situations in which things are prevented from continuing in their normal way due to problems and difficulties. ( ) Stop using a weapon or reactor and prepare to take it to pieces. ( ) The result of what is produced by the very gradual decaying of animal or plants over millions of years. ( ) What you feel or say about a situation from habit, without thinking about it. With each major surge in immigration to the United States, Congress has curtailed new arrivals and tightened the borders. With reference to the current crackdown, first the House passed an immigration bill. Now the Senate is debating two proposals. Can they compromise? Passed : The House bill, which calls for a 698-mile wall along the border, would make it a felony to be in the U.S. illegally and would penalize employers for hiring illegals. Proposed : Sen. Bill Frist’s measure also focuses on border security, but adds a call for temporary work visas. It doesn’t deal with illegal workers. The Senate Judiciary Committee wants to implement the McCain-Kennedy plan. It would institute a temporary guest-worker program and allow illegals to work toward citizenship. On the Horizon: Speaker Dennis Hastert hinted the House might soften its bill to reconcile with the Senate. refino da técnica, remoção da cartilagem do joelho e abertura do joelho. transplante do novo tecido diretamente no joelho, dificuldade de controlar o problema e refino da técnica. remoção das células de cartilagem do joelho, crescimento delas em meio de cultura e transplante do novo tecido diretamente no joelho. dificuldade de controlar o problema, remoção da cartilagem do joelho e transplante do novo tecido diretamente no joelho. remoção das células de cartilagem do joelho, crescimento delas em meio de cultura e abertura do joelho. Here is the first part of a letter, written by a 98-year-old pensioned lady to her bank manager. I am writing to thank you for bouncing my cheque with which I endeavoured to pay my plumber last month. By my calculations, three ‘nanoseconds’ must have elapsed between his presenting the cheque and the arrival in my account of the funds needed to honour it. I refer, of course, to the automatic monthly deposit of my Pension, an arrangement, which, I admit, has been in place for only eight years. You are to be commended for seizing that brief window of opportunity, and also for debiting my account to the tune of £30 by way of a penalty for the inconvenience caused to your bank. I noticed that whereas I personally attend to your telephone calls and letters, when I try to contact you, I am confronted by that impersonal, overcharging, pre-recorded, faceless entity, which your bank has become. From now on, I, like you, choose only to deal with a flesh-andblood person. My mortgage and loan payment will therefore and hereafter no longer be automatic, but will arrive at your bank by cheque, addressed personally and confidentially to an employee at your bank whom you must nominate. Be aware that it is an offence under the Postal Act for any other person to open such an envelope. Please find attached an Application Contact Status, which I require your chosen employee to complete. I am sorry it runs to eight pages, but in order that I know as much about him or her as your bank knows about me, there is no alternative. Please note that a Solicitor must countersign all copies of his or her medical history, and the mandatory details of his/her financial situation (income, debts, assets and liabilities) must be accompanied by documented proof. Escolha a alternativa correta, de acordo com o texto. A partir do ocorrido, a senhora comunica que apenas algumas de suas transações bancárias serão feitas automaticamente. Para as demais, solicita atendimento pessoal e confidencial de um funcionário que ela mesma selecionará, partindo de informações fornecidas em formulário documentado. A partir do ocorrido e das ligações não atendidas pessoalmente, a senhora comunica que duas de suas transações bancárias serão feitas por meio de cheque endereçado a um funcionário designado pelo banco, o qual deverá preencher um formulário de oito páginas e outros requisitos, especificados em sua carta. Devido à impossibilidade de falar ao telefone com o gerente, a senhora comunica que apenas algumas transações bancárias serão feitas automaticamente. Para as demais, enviará cheque nominal a um funcionário que ela selecionará a partir de informações médicas e documentos financeiros. Em função do ocorrido e das ligações nunca atendidas pessoalmente, a senhora comunica que apenas algumas de suas transações bancárias continuarão sendo feitas automaticamente. Para as demais, solicita o envio de um formulário confidencial que lhe deverá ser entregue por um funcionário designado pelo banco. Considerando o ocorrido, a senhora comunica que suas transações bancárias confidenciais serão feitas por meio de cheque endereçado a um funcionário, que deverá preencher o formulário anexo à sua carta, solicitando que ela aprove sua capacidade técnica e emocional. In December 1914 invading German troops and the defending Allies were dug in along battle lines in Belgium and France. From sodden trenches soldiers shot at each other across a no-man’s- land strewn with injured and dead comrades. But on December 24, at points along that western front, Germans placed lighted trees on trench parapets and the Allies joined them in an impromptu peace: the Christmas truce of World War I, a hundred years ago this month. The truce “bubbled up from the ranks” despite edicts against fraternization, says historian Stanley Weintraub, whose book Silent Night tells the story. After shouted exchanges promising, “You no shoot, we no shoot,” some erstwhile enemies serenaded each other with carols. Others emerged from trenches to shake hands and share a smoke. Many agreed to extend the peace into Christmas Day, so they could meet again and bury their dead. Each side helped the other dig graves and hold memorials; at one, a Scottish chaplain led a bilingual recitation of the 23rd Psalm. Troops shared food and gifts sent from home, traded uniform buttons as souvenirs, and competed in soccer matches. Adaptado de: Patricia Edmonds. National Geographic. December 2014. Vocabulário: shoot – atirar; truce – trégua; grim – horrível, repugnante; erstwhile – antigo. No que se refere à fala do soldado alemão: “How marvelously wonderful, yet how strange”, que encerra o texto, assinale o que for correto. O segmento é composto apenas por adjetivos e conjunções. A fala contém um verbo, um substantivo, um adjetivo e três advérbios. O segmento não contém nenhum verbo. A palavra "how" poderia ser traduzida por "quão" nas duas vezes em que aparece. Over the last hundred years or so, the instrumental temperature record has shown a trend in climate of increased global mean temperature, i.e., global warming. Other observed changes include Arctic shrinkage, Arctic methane release, releases of terrestrial carbon from permafrost regions and Arctic methane release in coastal sediments, and sea level rise. Global average temperature is predicted to increase over this century, with a probable increase in frequency of some extreme weather events, and changes in rainfall patterns. Moving from global to regional scales, there is increased uncertainty over how climate will change. The probability of warming having unforeseen consequences increases with the rate, magnitude, and duration of climate change. Some of the physical impacts of climate change are irreversible at continental and global scales. With medium confidence, IPCC (2007) concluded that with a global average temperature increase of 1-4ºC, partial deglaciation of the Greenland ice sheet would occur over a period of centuries to millennia. Including the possible contribution of partial deglaciation of the West Antarctic Ice Sheet, sea level would rise by 4-6m or more. The impacts of climate change across world population will not be distributed evenly. Some regions and sectors are expected to experience benefits while others will experience costs. With greater levels of warming, it is very likely that benefits will decline and costs increase. Low-latitude and less-developed areas are probably at the greatest risk from climate change. With human systems, adaptation potential for climate change impacts is considerable, although the costs of adaptation are largely unknown and potentially large. According to Schneider et al. (2007), climate changes would likely result in reduced diversity of ecosystems and the extinction of many species. Com relação aos adjetivos compostos low-latitude e less-developed, presentes no último parágrafo do texto, assinale o que for correto, no que se refere ao que essas palavras expressam. Falam das condições climáticas de determinadas áreas. Ambas referem-se à localização de certas regiões. Referem-se a certas áreas do globo terrestre. Qualificam algumas regiões da terra. In 1828, Charles Barbier, a visitor to Royal Institution for Blind Youth, introduced Louis Braille to a tactile dot code known as night writing. Barbier had invented the code to allow soldiers to communicate with one another in the dark, but his idea hadn’t caught on. It used dots to represent 36 phonetic sounds rather than the letters of the alphabet. Some of its characters were six dots tall. The Braille cells used today are two dots wide and three dots tall, and they no longer use dashes. You can represent each dot’s position within the cell with a number. A typical line of Braille is about 40 characters long, and a typical page of Braille is about 25 lines long. In other words, Braille takes up significantly more room than standard-sized print. Braille pages are also thicker and heavier than ordinary paper, and they have to be bound in a loose format so that pages can lie flat and people can reach the cells near the book’s binding. This leads to relatively bulky books. For example, the Braille version of “Harry Potter and the Half Blood Prince” is eight volumes long. Its longer predecessor, “Harry Potter and the Order of the Phoenix,” is fourteen volumes long. There are opposing theories about whether it is better for a person to learn contracted or uncontracted Braille. Some educators argue that uncontracted Braille is an important foundation for learning contracted Braille. In addition, learning characters for individual letters and symbols may be easier for young children who are beginning to learn to read. Opponents argue that uncontracted Braille is more time- and space- consuming than contracted Braille and that teaching the contracted version first requires people to learn two codes. ele ainda é amplamente utilizado por soldados do exército norte-americano. nele os pontos em relevo não representavam nem letras nem palavras. ele fez muito sucesso entre os soldados no início do século, mas caiu em desuso. nele todos os caracteres eram compostos de conjuntos de 6 pontos em relevo.